Free Drive-In Movie And New ABC Show Screening In Fort Worth! You are here: Home / Life Around DFW / Free Drive-In Movie And New ABC Show Screening In Fort Worth! 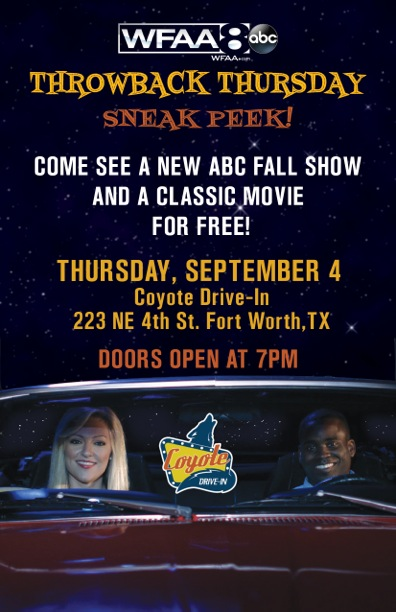 Dallas/Fort Worth, on Thursday, September 4th, 2014 you can see a new ABC show before it’s released AND a classic movie for free! On Thursday, head out to the Coyote Drive-In in Fort Worth, doors open at 7pm and have a great family night courtesy of WFAA!